Understanding your TOEFL iBT score. 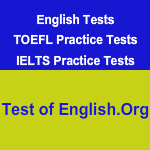 The TOEFL iBT test has four sections – reading, listening, speaking and writing. In each section the score ranges between 0 and 30. These scores are then added together to work out your total score which ranges between 0 and 120. The computer automatically scores the questions on the reading and listening sections. The speaking section has six tasks each of which is initially scored on a 0 to 4 scale. Your total score for the six tasks are then converted to the 0 to 30 scale. Note that certified test scorers rate your answers based on how well you give your responses in English. There are two writing tasks in the writing section. Each has an initial score of 0 to 5 which is then converted to a 0 to 30 scale. The writing tasks are scored on the basis of grammar, vocabulary and overall quality.